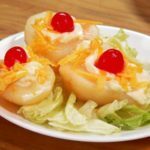 Easy to follow, step-by-step, photo illustrated recipe shows you how to make this easy Pear Salad with mayonnaise. Printable recipe included. Pear Salad is a southern classic, and so very easy to make. At first glance, this may seem like a strange combination of ingredients, especially if you’ve never heard of it. But, it’s very tasty. You just have to try it first. The slight saltiness of the cheese, mixed with the sweetness of the pear and the cherry on top, plus the bit of mayonnaise, make for a unique taste experience that’s hard to describe. Smile. This was a quick dish that my wife liked to make. And, she made it often. I was reminded of it when I took a bite out of a fresh pear a few days back. I hadn’t had one in some time and it brought back great memories of having this pear salad years ago. The name might throw you, because it’s not really a salad like we often think of salads. I’m not even sure why it’s called a salad. Smile. Canned pears are needed, and that’s what makes it so quick and easy. You’ll see the rest in the photo’s below. Just be aware that there are only a couple of small halves in each can this size. You can easily double the recipe if needed. Ready to give it a try? Alright then, let’s head out to the kitchen, and… Let’s Get Cooking! Easy Pear Salad Recipe – You’ll need these ingredients. Grate just a small amount of cheddar cheese. I like to buy the blocks of cheddar and grate my own. 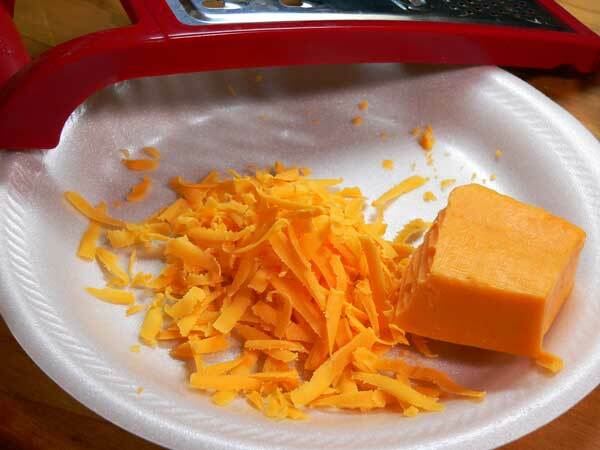 Those packages of pre-grated cheese come with a little bit of cornstarch on the cheese to keep it from sticking together. It also seems to be a bit harder in texture. You don’t need much. Drain the juice off of the canned pears. Discard the juice. 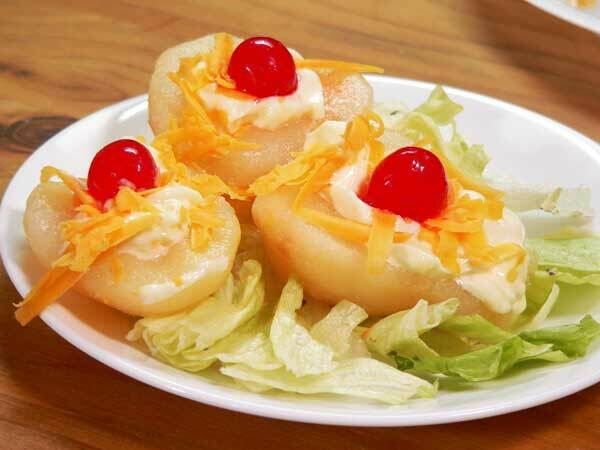 Place the pear halves on a plate, then add just a dollop of mayonnaise on each half. Sprinkle just a little of the grated cheese on top of the mayonnaise. Place one maraschino cherry on top of each pear half. You’re done! Place the pears on a bed of lettuce and serve cold. If you don’t have a head of lettuce, you could just pretend you do by picking out the green pieces of lettuce that come in one of those bags of shredded lettuce for about a dollar. Like me. I was trying to make it look better. Smile. Pear salad isn’t a real salad in the sense that you might be thinking of. It’s just a classic Southern side dish that is super easy to make. Tastes great too. Drain the juice from the pear halves. Discard the juice. Grate the cheddar cheese if needed. Place pear halves on a serving plate. 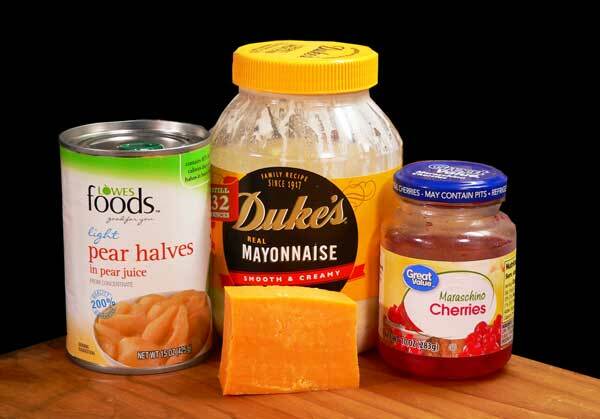 Add a small dollop of the mayonnaise to each pear half. Sprinkle a small amount of cheese on top of the mayo. 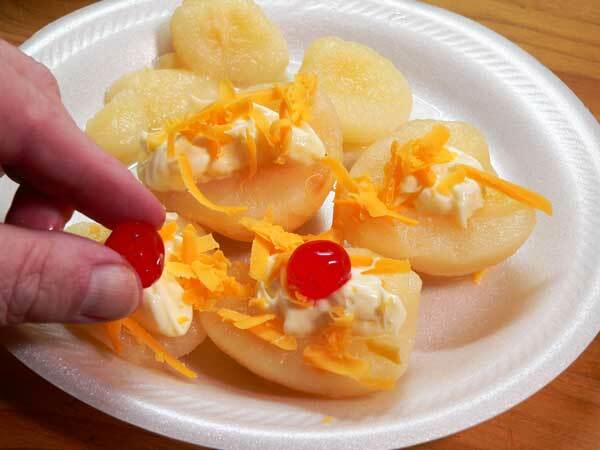 Add a maraschino cherry to the top of the cheese and mayo. A great kid friendly recipe that can be made in just a couple of minutes. Have you ever tried this type of Pear Salad? Think you will? Share your memories of this great Southern dish with us. It will only take a minute or two for you to leave your comments in the section below. My great aunt made this salad for special occasions back in the ‘50s. Seeing this recipe reminded me of her. Warm thoughts of her and the holidays. You bring up so many great memories. My Moma use to make this. I haven’t had it since. I have an abundance of fresh pears from my tree. I’m going to cook some and make this. Another memory was you mentioning the Thanksgiving hog butchering. I have great memories of that as well. I never watched the slaughter but I helped make sausage. It was a family reunion and everyone took home some fresh meat. Your recipes bring back great memories! My Mother made these for us a lot and my sisters and I loved them. I still make them because they are delicious, easy and I always have the ingredients. I may have one today! Happy Thanksgiving! I first had pear salad back in 2005. I was living in Columbus, GA at the time and a dear, sweet lady at church had me over for lunch one Sunday afternoon. I was very skeptical… I wasn’t sure what to think of the combination of ingredients, but not wanting to hurt Ms. Laura’s feelings…I dove in. And guess what? I was pleasantly surprised! It’s really good. Thank you for sharing this Mr. Steve. It brings back very fond memories of my dear friend! 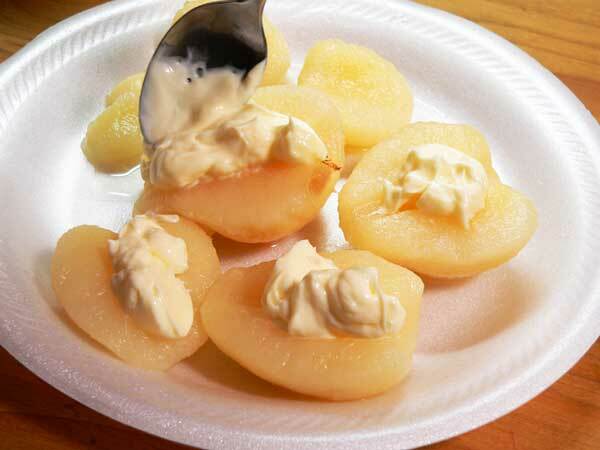 Just a note about Pear Salad- My Mom also made this along with either a pear or canned peach version – instead of the mayo and cheddar, she used a small spoonful of Cream Cheese in the center of the fruit and served it on lettuce leaves. it’s yummy but I don’t think to fix it very often. there are no mushrooms allowed due to a food allergy. A very HAPPY THANKSGIVING TO YOU! Hope you are feeling well enough to enjoy yourself. Good Afternoon Steve, I hope you’re doing well. I grew up with pear salad on the table a few times a week, although mama never put cherries on top. Have you tried it with sliced pineapple? It’s made the same way, I always drain and then pat with a paper towel. I enjoy your newsletters every Monday, I look forward to them, I’ve made some of your recipes. I really loved the broccoli casserole. I hope you have you vertigo under control, I’ve dealt with it for about 25 yrs. but I take medication that keeps it under control. This brought back memories of this pear salad. My mom made it all the time. We loved it, of course we used Hellmann’s mayo. Pear salad was a childhood favorite. 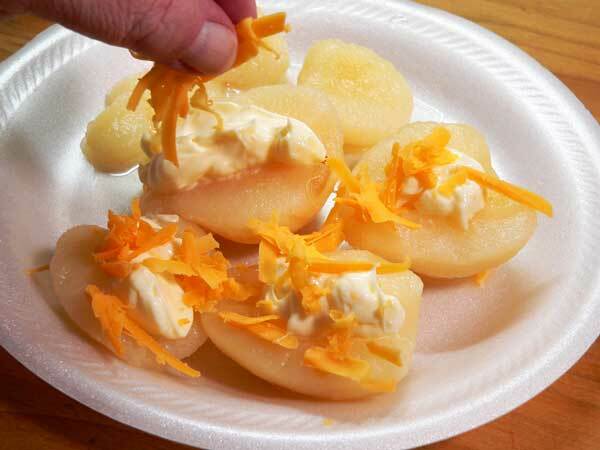 It was so easy to open a can of pears, spoon out mayonnaise, and grate cheese (no cherry) for a delicious treat. Thanks for the reminder. I hope you enjoy your Thanksgiving family get-together. My mother who has now passed made this exact salad often only with pineapple slices. Never tried with pears but I will tonight. Wonder if any one else has tried with pineapple? It’s also very good. My mother had roots from SE N.C.